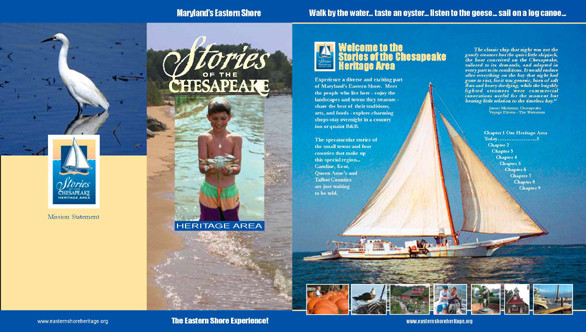 The Stories of the Chesapeake Heritage Area includes four rural Maryland counties on Chesapeake Bay’s eastern shore. One of the last great colonial landscapes in a substantially preserved state, more than 22 percent of its 1,200 square miles is permanently protected. 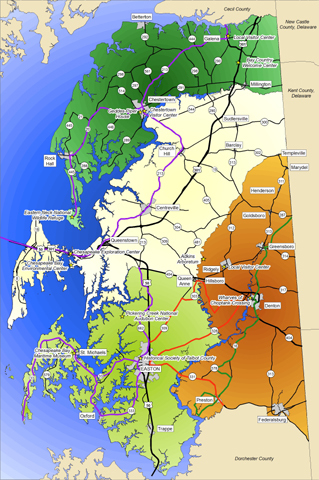 Scenic roads and waterways link 21 historic municipalities and many more agricultural and maritime villages. The area includes seven major rivers and more miles of shoreline than any comparable group of counties in the nation. Heritage Strategies principal Elizabeth Watson has consulted with the heritage area since its inception in 1997, soon after the Maryland Heritage Areas Authority was established. She worked with Peter Benton through 2000 on heritage area feasibility and early recognition, and with Krista Schneider and Shelley Mastran in 2003 on a major combined study of the cultural landscape and scenic resources. In 2002, she undertook the management planning phase as the first paid staff of the nonprofit managing entity, Eastern Shore Heritage, Inc., and served as the heritage area's part-time executive director through 2009. Her work has strengthened 30 organizations directly through heritage-area grants, with many others benefitting from technical assistance, grant coaching, workshops and strategic planning.